Tools, Dies, Setters - Index Fasteners, Inc. Weight per set (oz.) UPC No. Sets spur washers and grommets. Sizes 0 thru 5 drop forged, size 6, 7 & 8 malleable castings. Made to U.S. government specifications. Size No. Weight Each UPC No. Sets plain rim washers and grommets. Sizes 00 thru 5 drop forged, size 6 malleable casting. Made to U.S. government specifications. Properly machined and hardened. The finest industrial grommet die made. 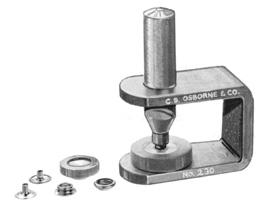 For best results use only Osborne grommets and washers. A complete and inexpensive kit for consumer use. 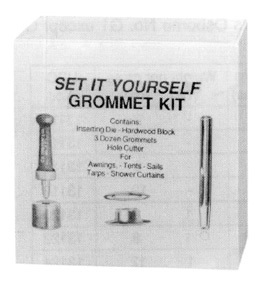 Each kit consists of a No.235 Grommet Die, a No. 245 Cutting punch, three dozen brass plain rim grommets and washers, a small cutting board and complete instructions. Packed in a case board box. Size No. Diameter of grommet (inches) Weight per kit (lbs) UPC No.